It was meant to be an overnight stop – but there’s no way we’ll fit everything in and reach Kalambo in time to pitch camp by daylight. We have to stay another night, but not at Thorn Tree. They have no room. Plan B was always my favourite. There’s something reassuring about the Catholic Mission outside town. With its grand old gardens and its fecund farm it exudes an air of calm that I suppose comes from the holy brothers. Though I’ve never actually seen any. Our first stay there was ‘interesting’. Our twin-single-bedded room looked as if it had just been vacated by a teenage boy. In a chunky bungalow, a former family house, it led off a huge sitting room, complete with sofa, armchairs – and a congealed-blood-coloured floor. We shared a bathroom with a couple intent on making as much recreational use of the bed as possible. He must have had bronchitis, or been drinking while (euphemism alert) gasping for breath the amount of coughing he did. And when I say ‘shared’ a bathroom, it was accessible from both our rooms but each of us could lock the other out. They did. But the meals were good and there was beer available to order – always a bonus. That was a few years ago – and now here we are again. Eight of us. We check in and divvy up the rooms. This time we have a shower to ourselves. The shower head hangs forlorn, mended with rags. Water trickles down the wall instead of spraying. But it’s clean. Unless you count the fact that it’s come through those rags. No, don’t go there. The day turns hot as we pick up our new colleague Victor from National Heritage. He volunteers to guide our shopping and we wander down to the centre of town, to a market of sorts. Buzzing with life, with colours and smells and sounds, it bakes in the full glare of the mid-morning sun. We ponder our pan requirements as bright sparks fly from a welder and the clang of metal on metal reverberates through the dusty air. We’ll have to come back later – they’re being welded for us to our chosen size. Never had pans made for me before – I have to assume Victor knows what he’s doing. I’m on more comfortable ground with tin plates and cheap cutlery. Plastic bins for storage. Loo rolls. Soap. Tea towels. Scrubbing pads for dishes. A kettle. A water barrel that doesn’t smell too bad – and has a lid. The list of ‘might needs’ keeps on growing. When you’re nearly three hours’ drive from the nearest town you don’t want to have to slip back for a few things you’ve forgotten. Like matches. Especially matches. The supermarket’s a great big Shoprite, impressively well stocked. I decide to leave the 12 (or so) loaves till the next day, so it’s fresh, but stock up on tins of tomatoes and beans, bags of dried soya chunks, rice, candles, UHT milk. Lentils. Paraffin lamps. I buy matches, many matches. And a plastic box to put them in. You never know. It’s been a while since I did this campsite cooking lark and I’m anxious. Want to buy the vegetables now but everyone agrees – there will be roadside markets on the way. Cheaper. Fresher. We pick up our pans and head back to the mission, drop them and the water barrel off for a good wash. One of the pans has a very odd blackness across its base, as if it was engraved. I try not to think about what it might have been in another life. At least the barrel’s not bad. The last one we had never lost its taste of oil – mechanical oil. A quick (Zambian quick) sandwich and we’re on the road again, off to see the rock art. Our caravanserai slows to a stop by a small road near some big, rocky hills. The Pied Piper would be redundant here – all you need is white folks and the children come running, materialise from seemingly nowhere. Rosie dispenses more balloons, I hand over sweets. Fruit sweets – that makes it all right, doesn’t it? A young man arrives, also seemingly from nowhere. Turns out he’s a guide, an official guide. 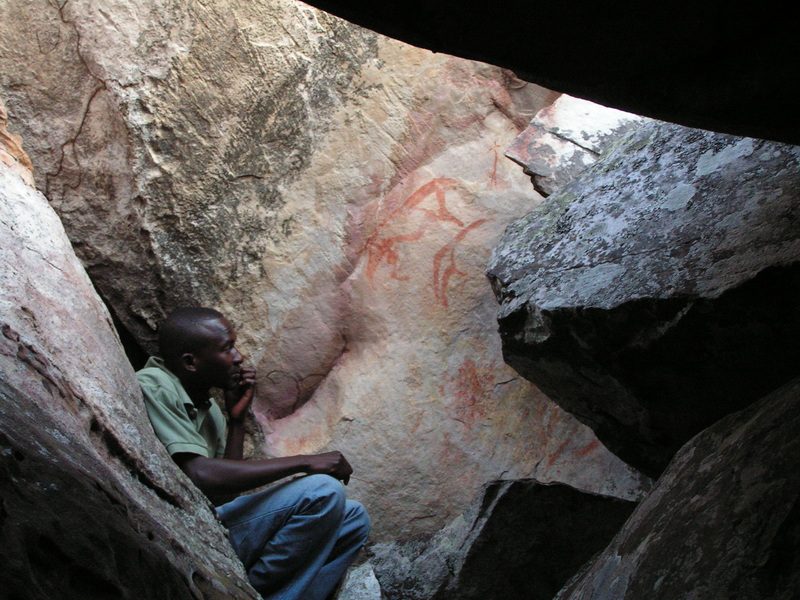 Zambian rock art can be disappointing if you go expecting deep caves adorned with cavorting, Lascaux-style animals. A lot of it’s geometric – lines, circles, dots and so on. Think Bridget Riley but (mostly) red. We’re all impressed – with the art, not the biblical verse – if a bit tired, what with all the clambering. On the way back we manage a diversion via an old friend, Victor’s boss, then on to Victor’s. 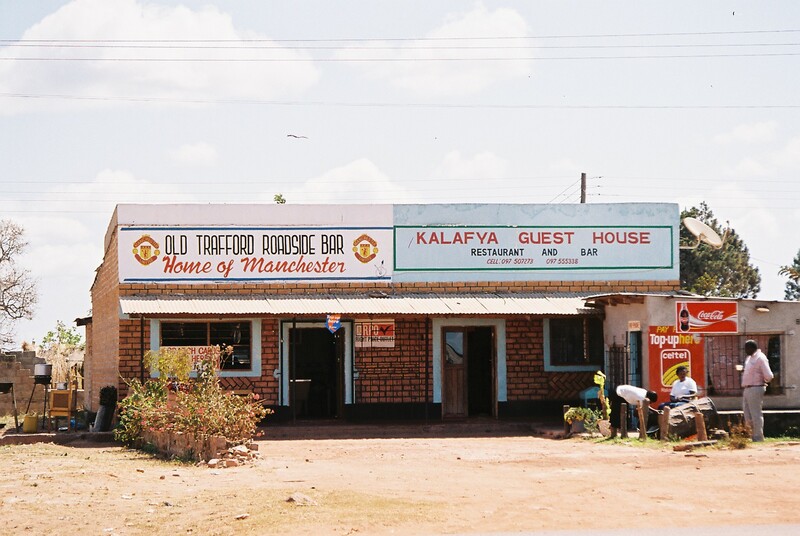 We meet his family, drink a welcome glass of Mazoe – the odd, slightly bitter and strangely addictive orange squash (that’s a dilutable drink, dear Americans, not a vegetable) that’s the staple ‘orange juice’ around rural parts. Over dinner it turns out the mission’s supplies of alcohol have run out and in the absence of a miracle we resort to the box of red wine we’d stashed for our trip. Several thirsty souls deplete it significantly. But we can buy some more tomorrow. Except the shop’s not open. But as we queue to take out cash from the one cash machine in town (a wonder it hasn’t run out already) something wonderful happens – Shoprite opens. Just later than usual. Soon we have 11 loaves of fresh, warm sliced bread stored in our plastic bin where they’re sweating nicely in the warmth. And we have a new – smaller – box of wine. There’s one last thing. Wooden spoons. We run through a market on the way out of town and pick up a few, passing Old Trafford – home of Manchester United – as we do. And then we’re off. I feel a mixture of emotions – but mostly fear. Have I got enough food? Will the site be OK? Will there be drunken partying locals with boom boxes there like there were last time? Where will we pee? But there’s nothing I can do about it now. Just hope. This entry was posted in Travelling, Zambia and tagged Banksy, Kasama, Manchester, Marianhill Mission, Northern Province, Old Trafford, rock art, Travel, Zambia. Bookmark the permalink. I’m enjoying your narrative. 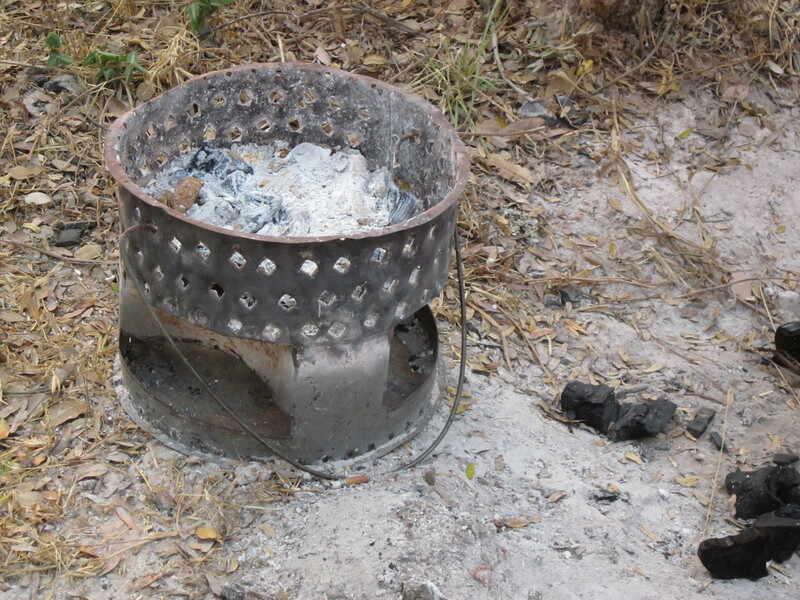 Would love more details about cooking on the Mbuala for a large hungry group. What year was this trip? ha, you’re a perceptive person! 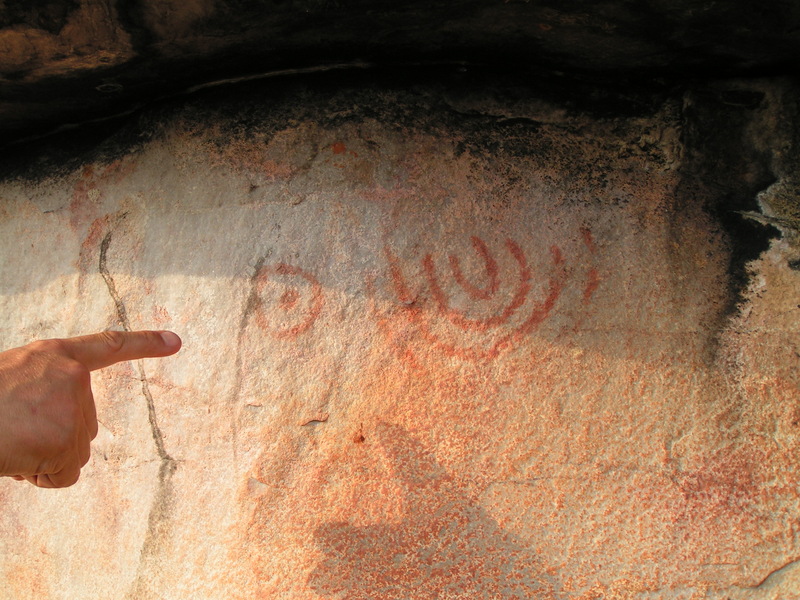 Thank you for the photos of those mysterious rock paintings. Aah, those congealed-blood-coloured floors, I’d forgotten about that. Red stoep polish. Did I tell you about “Beyond the Malachite Hills”, by Jonathan Lawley (pub. I.B. Tauris, 2010), a close contemporary of mine at Rhodes? Began his professional career as an Assistant District Officer at Kalomo progressing through the Copperbelt to D.O. at Lake Mweru and the post independence administration in Lusaka; then a series of industrial personnel/training/consulting jobs in various southern and central African countries, with “a lifelong attachment” (from the blurb) to Rhodesia/Zimbabwe. I think you’d find it interesting. Another one that I should think you’d enjoy is “The Africa House” by Christina Lamb (Penguin) about Stewart Gore-Brown and the plantation he created and house he built at Lake Shiwa (Ishiba on the map) Ngandu, back in the 20s, turnoff to the right about 50 miles, 80 km beyond Mpika. Or have I mentioned this one before? 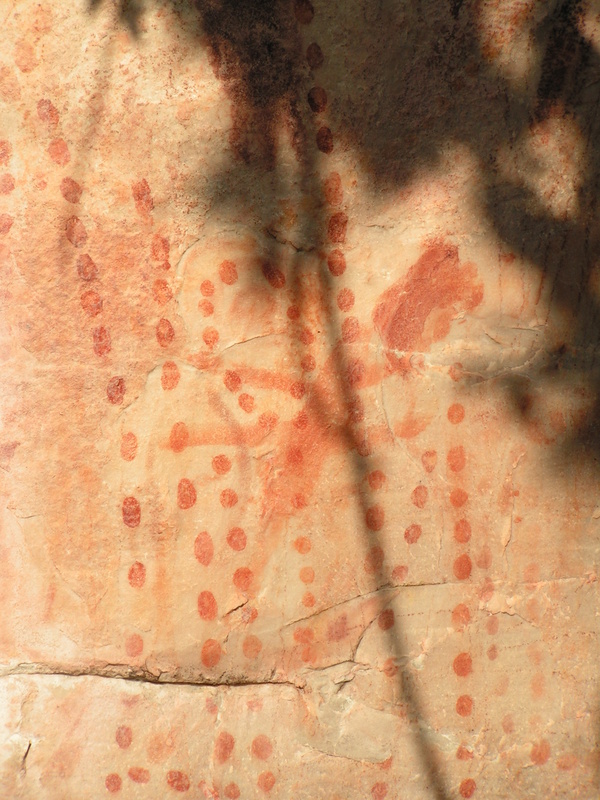 I see your guide took you to at least two of the Kasama painting sites Ben Smith used in his publication – the leopard and the line of stick people – standard tourist points now? I like your landscape photo with its rugged foreground and distant horizon, typically African. 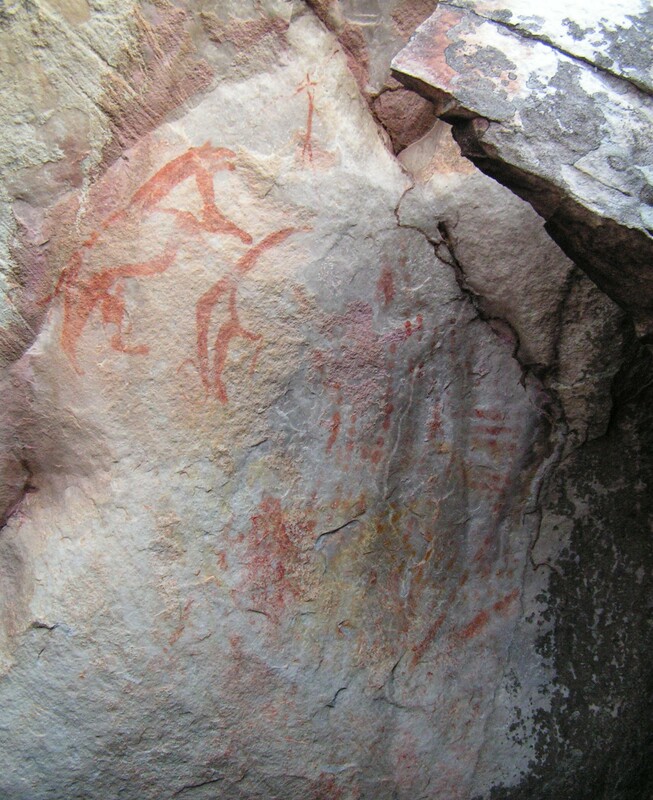 There are geometric paintings in Malawi but as far as I know (which is not really very far) no animal ones have been found there. Those lines of blobs, you can just imagine the painter dipping a fingertip into the paint each time, patiently placing one after the other on the rock face. 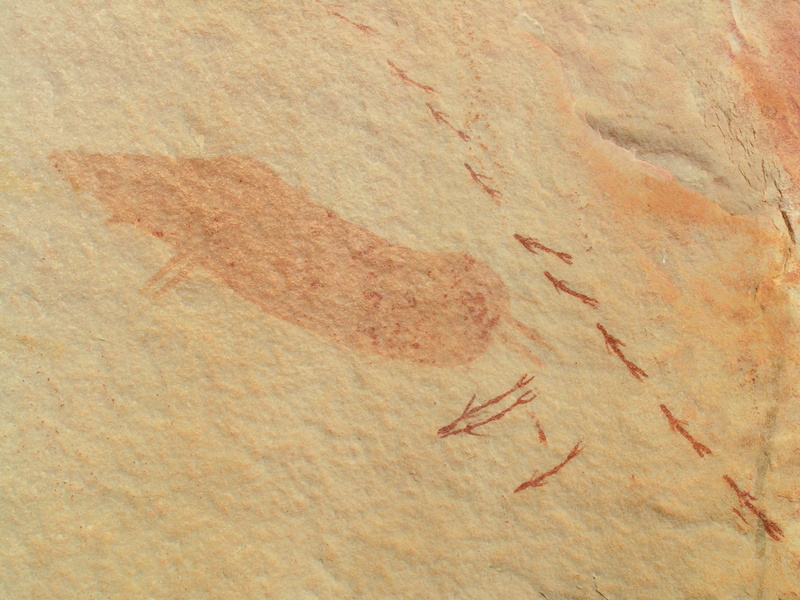 But that one with the two animals facing to the right has a different kind of broken line, thin, dark (are they black?) 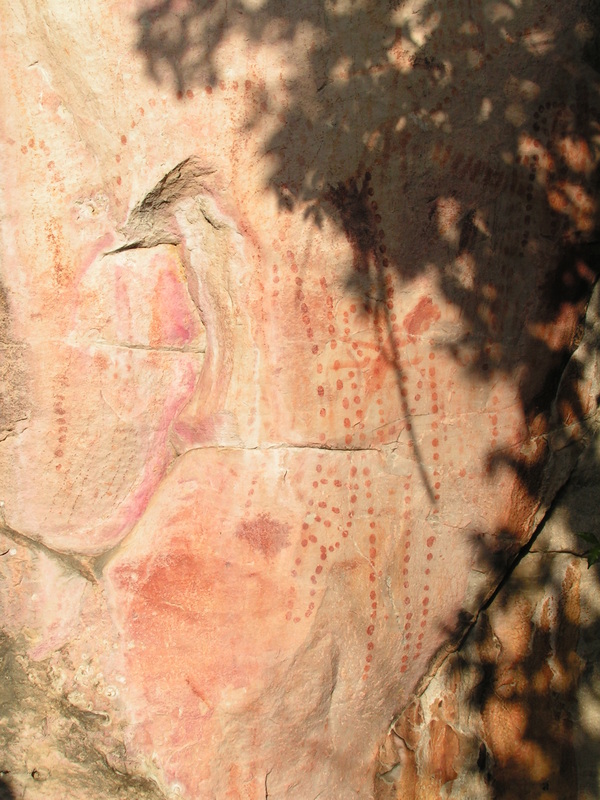 mostly near-vertical with one horizontal row, later than the red paintings. 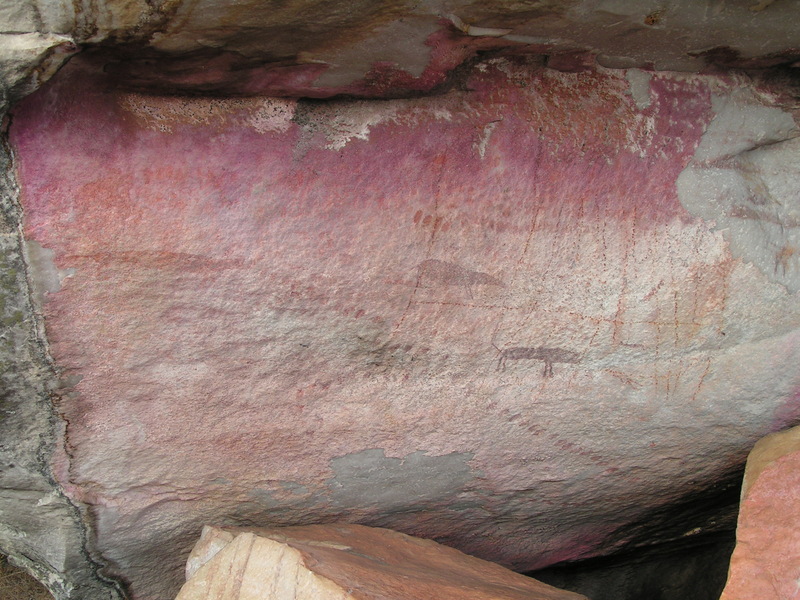 Is it just the irregularities of the rock surface that make the lines dotted or were they painted/drawn like that? And what are those elongated animals to the left? It’s a real pleasure to read your exchanges with Thel, one can feel the warmth. I looked up Susan Sarandon and did you realise the film was back in 1991? 20+ years ago! I think that’s enough for now. To be continued. Hello John and thanks for the recommendation of The Malachite Hills – I must read that. And tell me more about Rhodes one day. 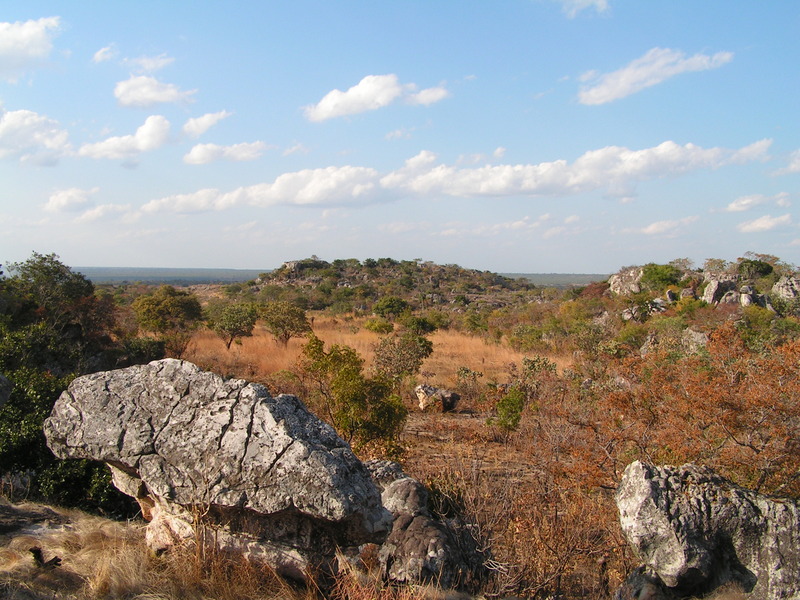 I have read the Africa House – ‘Anthro-man’ was invited to look at some artefacts at Shiwa but the proffered trip came to nothing – it may happen one day, who knows. 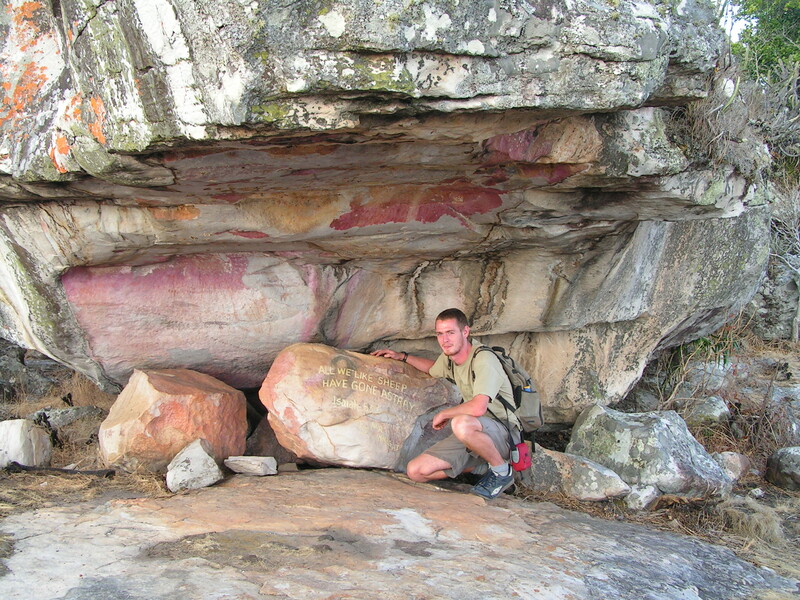 Re the rock art, I don’t think anywhere around the far north is very touristy – yes there is a guide and he will take you to the rock art sites but they are still little known outside specialist circles and I guess not very much visited by our standards. We saw a few more but there are hundreds and some of the photos were not worth putting up – some of the pieces are little more than a daub or two. 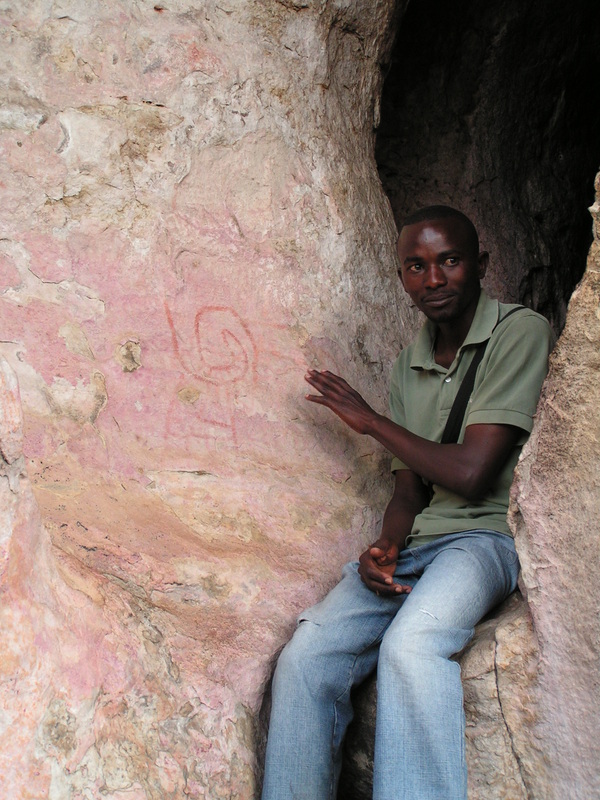 The team did look at some rock art at Mutinondo (south of Mpika) but I don’t know if there is anything published I’ll ask. I believe there is a commercial flight starting/started to the north so that may change things. I’ll email you about the art when I have a chance to talk to A-M. Was Thelma and Louse really that long ago? Goodness. I’ve always admired Susan Sarandon though I’m not suggesting I admire criminal women, just spirited women! Yes, just spirited women, of course. Please don’t bother A-M, it’s of no importance. Is Before Farming still functioning? I looked on the site a while ago to find it had been taken over since 2012 by another publisher, but looking again the other day found no mention of that. Perhaps I didn’t look hard enough. Hi John, yes BF is still functioning and the very last issue awaiting editorial. A blog post will appear about it in due course. Did you get my last email? I’ll email you about it soon if so. Difficult time for A-M at the moment.